Background and objectives Incidence of ESKD is three times higher in black Americans than in whites, and CKD prevalence continues to rise among black Americans. Community-based kidney disease screening may increase early identification and awareness of black Americans at risk, but it is challenging to implement. This study aimed to identify participants’ perspectives of community kidney disease screening. The Health Belief Model provides a theoretic framework for conceptualization of these perspectives and optimization of community kidney disease screening activities. 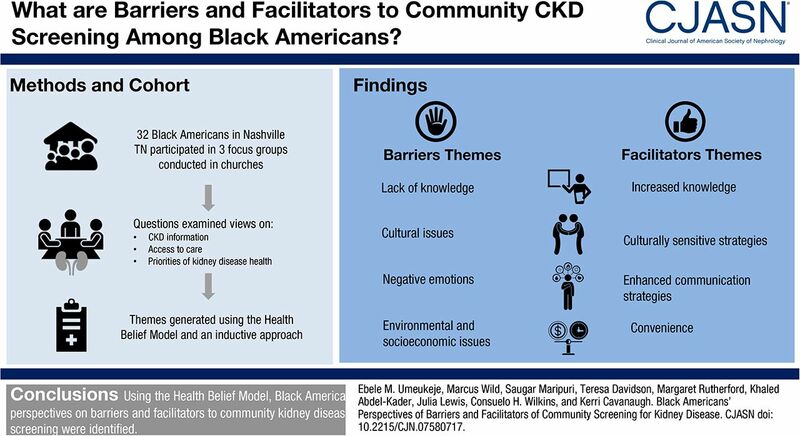 Design, setting, participants, & measurements Researchers in collaboration with the Tennessee Kidney Foundation conducted three focus groups of adults in black American churches in Nashville, Tennessee. Questions examined views on CKD information, access to care, and priorities of kidney disease health. Content analysis was used. Guided by the Health Belief Model, a priori themes were generated, and additional themes were derived from the data using an inductive approach. Results Thirty-two black Americans completed the study in 2014. Participants were mostly women (79%) with a mean age of 56 years old (range, 24–78). Two major categories of barriers to kidney disease screening were identified: (1) participant factors, including limited kidney disease knowledge, spiritual/religious beliefs, emotions, and culture of the individual; and (2) logistic factors, including lack of convenience and incentives and poor advertisement. Potential facilitators of CKD screening included provision of CKD education, convenience of screening activities, and use of culturally sensitive and enhanced communication strategies. Program recommendations included partnering with trusted community members, selecting convenient locations, tailored advertising, and provision of compensation. Conclusions Findings of this study suggest that provider-delivered culturally sensitive education and stakeholder engagement are critical to increase trust, decrease fear, and maximize participation and early identification of kidney disease among black Americans considering community screening.